Heat oven to 400°F. Grease cookie sheet with shortening or cooking spray. Unroll dough onto cookie sheet into 14x9-inch rectangle. With fingertips, make indentations over surface of dough. Drizzle oil over dough. Top with remaining ingredients except pasta sauce; press lightly into dough. Bake 13 to 18 minutes or until golden brown. Cut focaccia in half lengthwise; cut each half crosswise into 14 sticks. 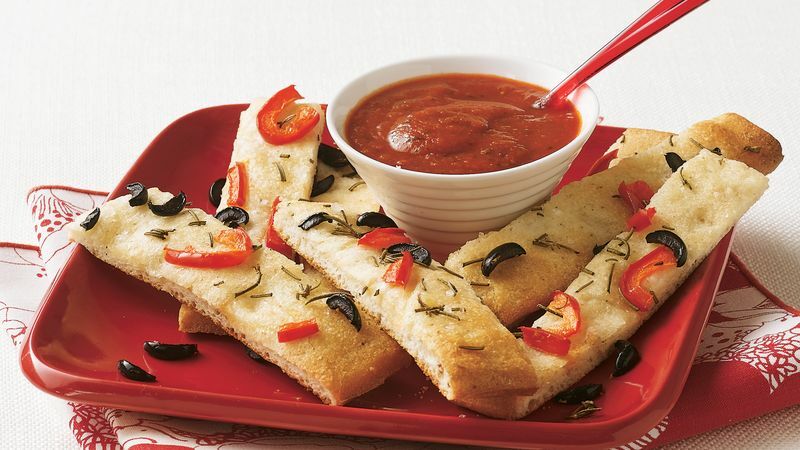 Serve warm sticks with warm pasta sauce for dipping. Use your hands to press the toppings gently into the dough so they don't fall off when you cut the sticks.